Will property developers still find such deals feasible in the long run? Several homeowners in the prime District 9 of Singapore are still setting their sights on a collective sale and hoping real estate developers will find properties in these areas as attractive propositions despite the recent introduction of harsher property cooling measures by the government. Earlier this week, over 80% of the homeowners at St Thomas Ville have given the ‘green light’ for the 17-year old development to be put up for a collective – at an asking price of no less than $58 million. The 12-storey freehold apartment comprises of 23 private homes in total and is sitting on a site with an area of 11,407 sq feet. Under the URA Master Plan 2014, the St Thomas Ville site has a gross plot ratio of 2.8 and permissible height of 36 storeys maximum. The asking price will work out to be around $1,816 psf ppr, but if it was to factor in the 10% bonus balcony and a development charge of approximately $3.6 million, it will bring down the psf ppr rate to around $1,754 instead. It was noted that the St Thomas Ville site is within just 600 metres away from the upcoming Great World MRT station;close proximity to the Orchard Road shopping belt and the Great World City mall. Just slightly down the River Valley Road stretch, The Regalia has only been put up for collective sale – at an asking price for $403 million or a land rate of $1,892 psf ppr. 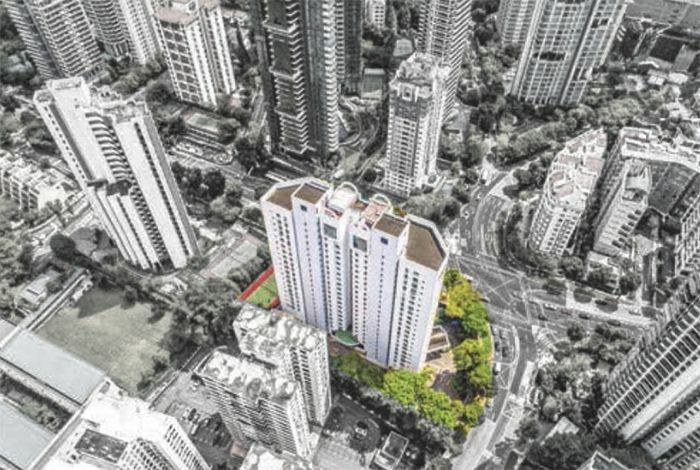 The 20-storey development is currently sitting on a freehold site with a land area of 63,371 sq ft and is housing a total of 116 private homes in total (inclusive of 4 penthouse units). According to the marketing agency of The Regalia, the land rate would be further reduced to $1,814 psf ppr if the 10 percent bonus balcony space has been taken into consideration. And based on the latest Master Plan, the site has a redevelopment potential of up to 36 storeys tall – with a plot ratio of 2.8. It also has a maximum GFA of 234,357 sq ft, which will allow the future new launch project at River Valley Close to yield around 302 private residential units. It was reported both these 2 freehold sites are not subjected to the stipulated guidelines by URA to have a minimum average unit size of 70 sqm for their redevelopment projects as they are both located within the Central area of Singapore. Looking at the asking land rates for both St Thomas Ville ($1,754 psf ppr) and The Regalia ($1,814 psf ppr), they would be presenting themselves as attractive propositions to developers as Pacific Mansion (a nearby development) was sold for around $1,987 psf ppr earlier in March this year. On top of that, the most recent new launch project in the area – Martin Modern by GuocoLand has been selling its units at an average psf of $2,355 (as of 08 August 2018), which made be used as a benchmark for future pricing. The project is a 99-year leasehold condominium in Singapore and currently has a take-up rate of 56.9% (to-date); due for completion by 2021.